Follow the Port Solent channel until you see the two yellow diamond transits inline with one above the other. These can be seen to the left of The Drystack pontoon, on the corner of the ship lift quay. Keep these diamonds aligned until you reach the wall of the ship lift, turn to starboard to follow the wall to the Drystack pontoon. 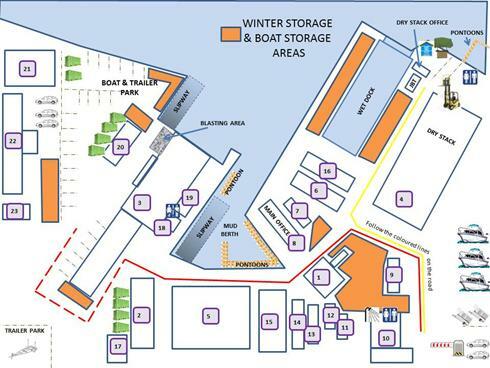 Pass The Drystack pontoon and the wetdock entrance. Then follow the sea wall on your port side keeping about a boat length away from the wall. Soon you will arrive at the Trafalgar Wharf lifting slipway and pontoon. 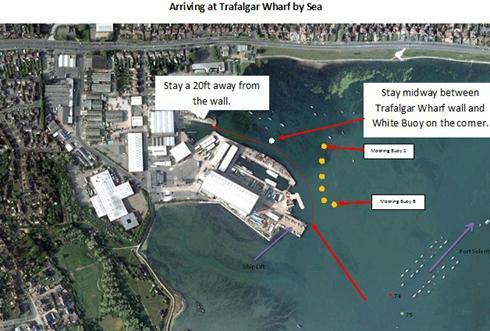 Click on the picture below to see a video of how to get to Trafalgar Wharf and The Drystack by sea. Trafalgar Wharf is situated about 10 minutes’ walk from Portchester Train station. From the train station; turn right (down the hill) until you reach the roundabout. Turn left at the roundabout and head straight for 100 yards. Take the next right onto ‘Castle Trading Estate’ and follow the road to the end where you will find Trafalgar Wharf. From the East join the A27 West bound, signed for Portsmouth. Shortly after the junction for ‘Central Southsea’ merge with the M27. Leave the M27 at J12 and approach Roundabout. Take the 2nd exit onto ‘Western Road.’ past a large business park on your left called ‘Lakeside’ continue straight to the ‘Marriott Hotel' traffic lights. Head straight across at the lights and continue along the A27, past a Marriot Hotel, Tesco and Peugeot garage. Continue straight across through the traffic lights until Portsmouth Harbour is on your left. Approach two sets of traffic lights, at the first head straight over but turn left at the second set (at a large Kwik Fit and furniture shop). Follow the road all the way to the end and Trafalgar wharf will be in front of you. At the barrier; Press 1C for Trafalgar Wharf or 34C for The Drystack. From the M27 east bound leave at J12. At the traffic lights take the left filter road. Head on the A27 westbound, past a Marriot Hotel, Tesco and Peugeot garage. Continue straight across through the traffic lights until Portsmouth Harbour is on your left. Approach two sets of traffic lights, at the first head straight over but turn left at the second set (at a large Kwik Fit and furniture shop). Follow the road all the way to the end and Trafalgar wharf will be in front of you. At the barrier; Press 1C for Trafalgar Wharf or 34C for The Drystack. If you are using Sat Nav our post code is PO6 4PX, this may take you down Hamilton Road which has is a dead end. If this is the case turn round, at the end of the road turn left onto the A27. Then take the next left onto Castle Trading Estate, you will find Trafalgar Wharf at the end of this road.